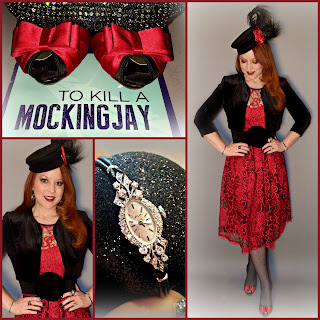 If you know me, even a little, you know how much I love a themed event, and you know how much I love a vintage look. 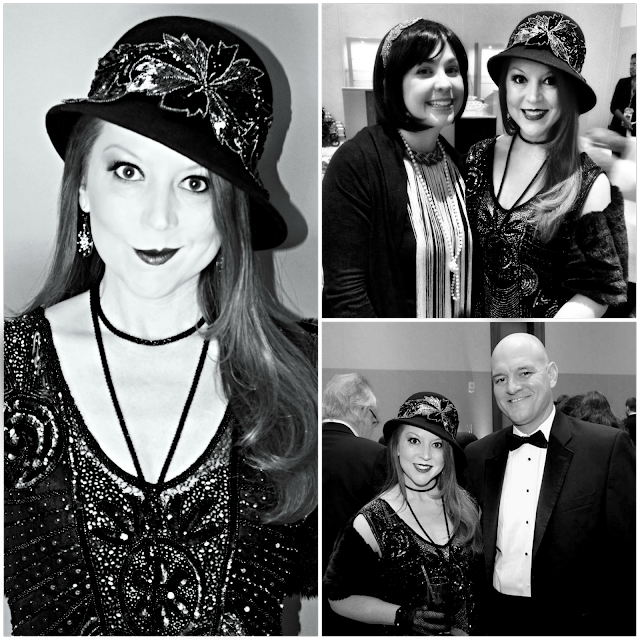 So, it might surprise you to learn that, until last month, I had never been to a 1920s themed soiree. 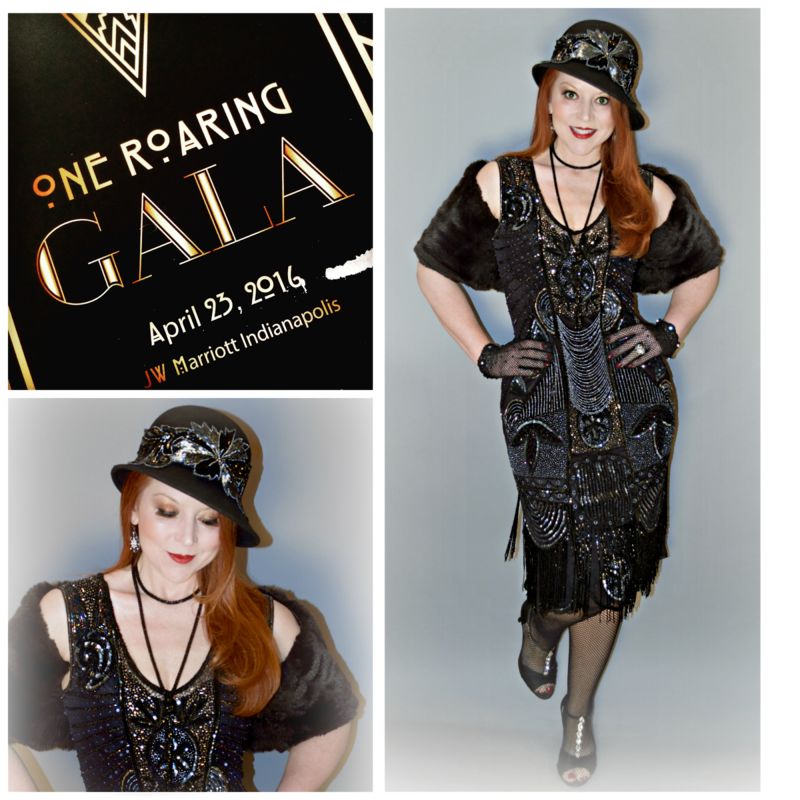 So, I was excited when I learned this year's JDRF gala would have a "Roaring 20s" theme. 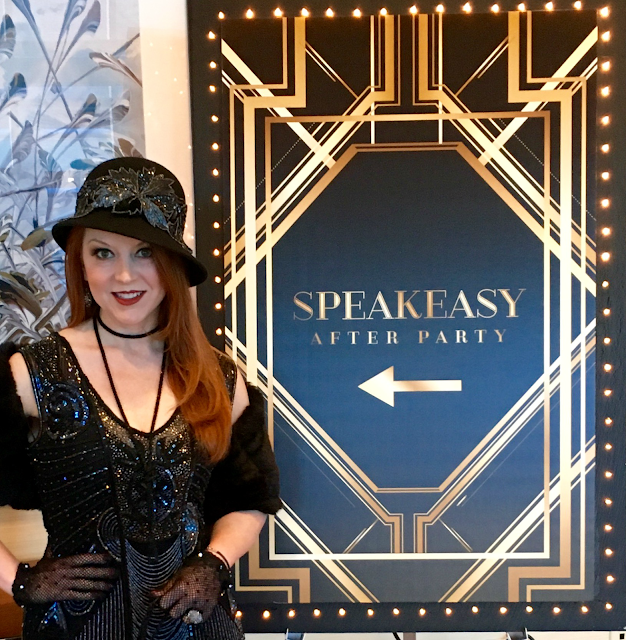 The annual fundraiser is always a stellar event for a great cause, but the addition of the theme added an extra spark of energy to the evening, and set it apart from a Spring full of hotel ballroom chicken dinners and silent auctions. 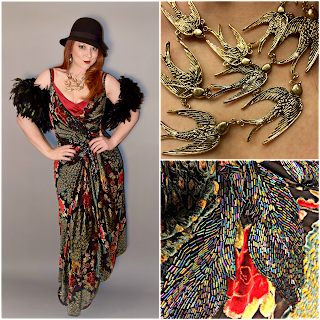 The burned-out velvet gown and feather boa (left) once graced the stage in the IRT's production of The Great Gatsby, though it can pass for a more contemporary design that I'll wear to other events. 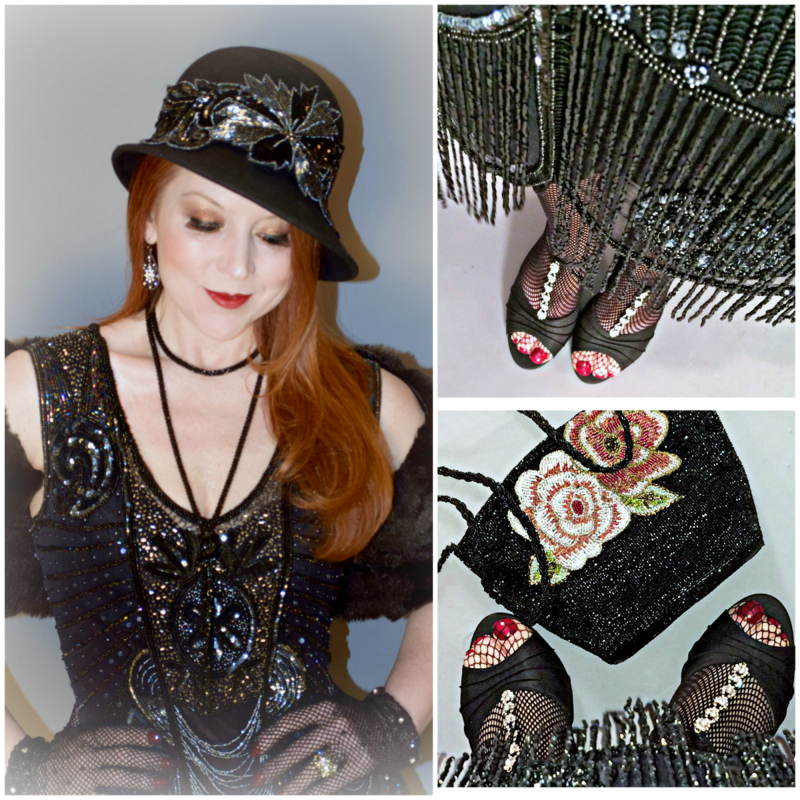 A vintage beaded handbag, vintage jet beads that once belonged to my Grandma Coy, a black wool cloche, and black crocheted lace gloves with crystal accents, complete my 20s era look for the gala. 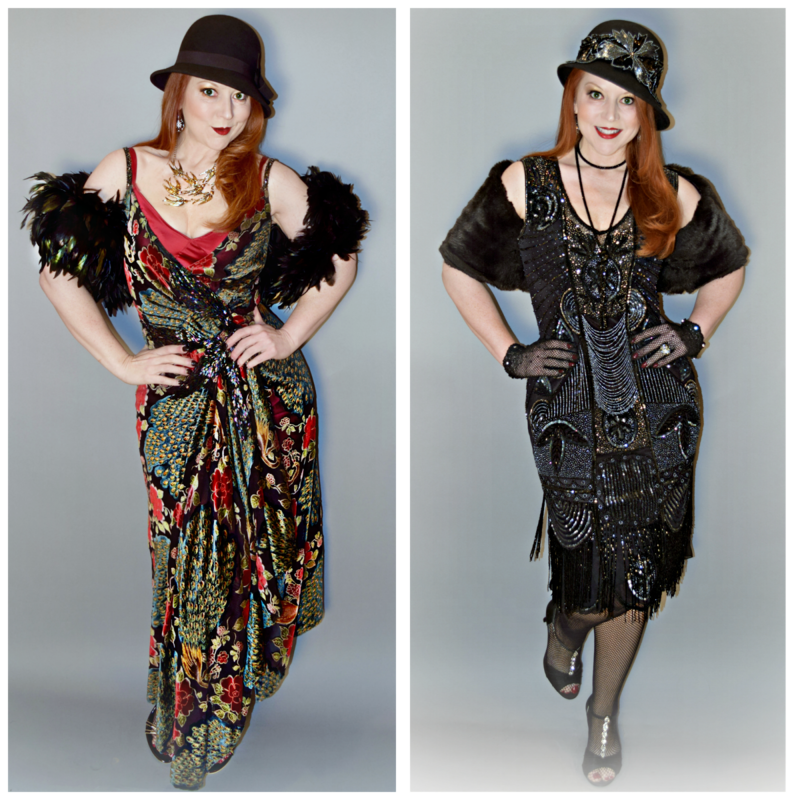 Though I love both dresses, the black fringed flapper won the day. I felt like it was the most obvious nod to the decade, whereas the velvet gown could pass for a more contemporary design. Indeed, while the LBD is not an actual vintage piece, the hand-beaded reproduction is spot-on: the iridescent glass embellishments are affixed to a transparent black mesh base that must be worn over a solid slip to avoid a "wardrobe malfunction." This was typical of the era...and I was shocked to learn just how heavy such dresses were. Who knew that a knee-length, see-through cocktail dress could weigh nearly 10 pounds! Those thousands of beads are heavy...all the better for burning off dessert on the dance floor at the after-party in the "Speakeasy!" 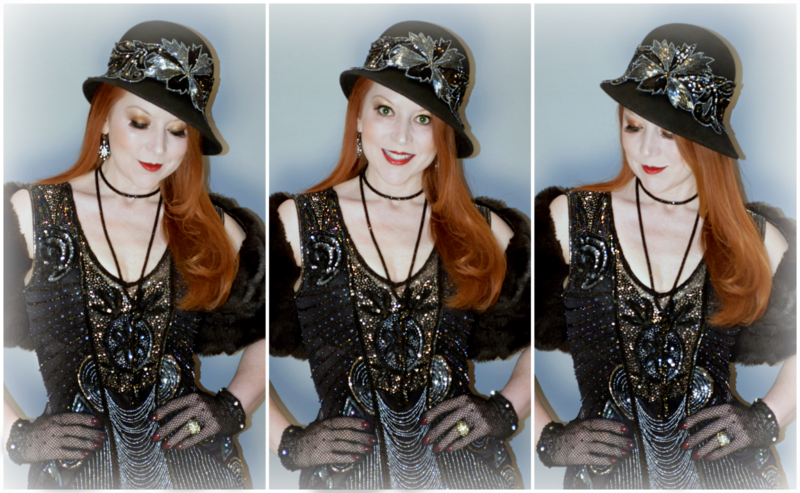 I used Hollywood fashion tape to affix it the glass beaded applique to my black cloche, so that I'd be able to remove it at the end of the night and continue to use the hat for everyday wear. I expected to (and did) see a number of feather-embellished headbands at the gala, but I went with a simple black cloche I wear often. I glammed it up for the occasion, however, with an inexpensive glass beaded applique from Etsy that echoes the elaborate design of the dress. I love how it came together, and I'll be happy to pull it out again should another invitation to a "Gatsby" affair come my way. Wow! I'm impressed with both outfits. You have quite the closet!